Uttar Pradesh Chief Minister Yogi Adityanath on Sunday asked all Bharatiya Janata Party office bearers and public representatives not to undertake any contractual work and instead monitor them for effective execution. He said BJP’s unprecedented win the recent assembly elections had only increased the responsibilities of the party and its workers. “No office bearer of the party or any public representative should undertake any contractual work (thekedaari). They should rather monitor them. And, if they find any discrepancy, they can inform me, so that action could be taken immediately against the guilty,” he said. Adityanath also laid stress on sense of responsibility and accountability among his ministerial colleagues. “I am the CM. (Surya Pratap) Shahi ji is cabinet minister. But the post of CM or cabinet minister is not meant for flaunting. In fact, it is an indicator of one’s responsibility and accountability towards the public, which elected you with an overwhelming majority,” he said, pointing towards some ministers present there. “In the next two years, you have to work tirelessly, irrespective of the fact that there is sunshine, rain or biting cold. Efforts should be made to ensure that the welfare schemes of the Centre percolate to the last strata of the society, and needy people are able to avail its benefits,” he said, amidst a thunderous applause from the audience. Underscoring the need for improved work culture, the Uttar Pradesh chief minister also said people who were prepared to work for 18-20 hours a day are ‘most welcome’ to join him, the rest are free to leave. “Time has come that we should work 18-20 hours a day. There no time for any mauj masti (entertainment),” he said. “For the past few years Uttar Pradesh has been defined as a state from whose boundaries begins darkness, from where the pot-holed roads begin and the place from where the women start to feel insecure. I was to break this mindset,” he said, and added that he wants to make UP a place, where women feel safe and secure. “The doors of your house and office must remain open to the public. This would ensure that the government is able to reach to the last person of the society. No one would go to bed empty stomach and money would not be a constraint in marriage of any girl,” he said. He also referred to the Agra loot, which was worked out. “There is no place for those who give patronage to the goonda elements, mafia, criminal and other rogue elements. They have the option of leaving UP or else they would land in places designated for them (jails),” he said, while hinting at massive revamping of law and order. He also talked about people committing electricity theft facing the music. “The situation has already improved in Gorakhpur and it would soon improve in the state as well,” he said. “If you find any discrepancy or anomaly, just message me the relevant details. I will ensure action,” he said. The UP CM showered accolades on Prime Minister Narendra Modi, BJP chief Amit Shah and party workers for the party’s massive victory in the state assembly polls. “The welfare schemes initiated by the prime minister, the brilliant poll strategy of BJP chief Amit Shah and the ground work done by party workers helped us to come to power after a gap of 15 years,” he said while addressing public at the party’s regional office in Gorakhpur. Boosting the confidence of his party workers, he said that virtually every worker of Goraksh Praant (Gorakhpur region) can work as a chief minister. “When the UP assembly elections were going on, at one point of time, we felt as if that our innings is trembling. I got a call from party chief Amit Shah. I went to Delhi to meet him. I was told by him that the party must bag 40 out of the 62 seats in the region. 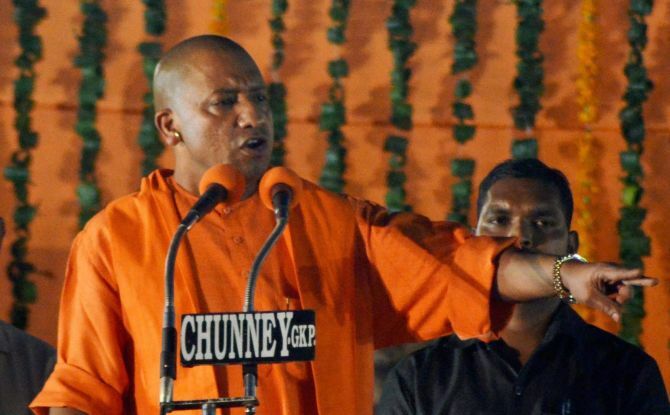 When the results were announced, we emerged victorious on 46 seats,” Adityanath said. The chief minister also said that the weak areas would be identified and necessary will be action taken accordingly. He also mentioned that in future, the party would hold at least one programme in the hamlets with majority of people from backward/most-backward classes. Similar programmes would also held in slums, he added.